I associate whale watching with choppy waves, ocean spray on my camera, and seasick compatriots. But on the north shore of Canada’s Saint Lawrence River near Tadoussac, Quebec, there is a deep channel near land where you can see even the biggest of whales without donning a lifejacket. 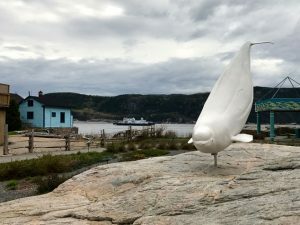 The reason so many whales come close to Tadoussac – one of the first settlements on Québec’s north shore – is the deep Laurentien channel near land and a steep rock wall that whales use to corral krill. Baleen whales like humpbacks, minkes, and blues love krill and will launch themselves through the krill they’ve gathered, mouths open to swallow as many as possible, and delighting people lucky enough to see lunges that break the surface. Hoping to see whales feeding I wander the short wooded path to the St. Lawrence, the smell of fir and salty air tickling my nostrils. There’s a cold breeze lifting off the water as I scramble onto rock slabs overlooking the St. Lawrence. I can’t tell by looking at the inky-blue surface but this water can provide the 40 million krill a blue whale can eat in a single day! Within moments there’s a staccato burst of air as a whale breaks the surface with its blow; the glossy back of a minke twinkling in the sun before it slips back to the watery buffet. I watch as the whale reappears several times on a northward track. Realizing I’ve skipped the wine in my terra firma whale watching adventure I head to a small restaurant – La Galouine – near the village center. Owners Paryse Deschenes and Martin Brisson offer local cuisine and white wine from Quebec’s eastern townships. Whales by land and by sea – Click to Tweet. The best place in the world to see whales from shore – Click to Tweet.